Highly dense, vertically aligned silicon nanowires (SiNWs), having diameters in the range of 40–100 nm and length upto 5 µm, are grown by metal assisted chemical etching technique on p-type polycrystalline silicon (pc-Si) substrate. 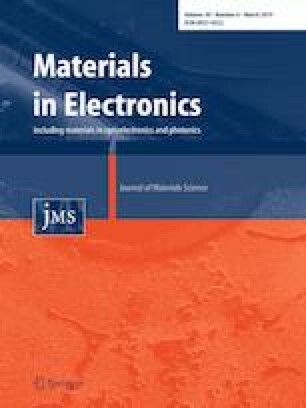 The hetero-junction photodiodes, for ultraviolet sensing application, are fabricated by depositing tin oxide (n-SnO2) onto pc-Si and SiNWs on pc-Si surface, using simple and low cost electrochemical deposition technique. The prepared SiNWs and n-SnO2 decorated SiNWs are examined by scanning electron microscopy and elemental dispersive analysis by X-ray. Three photodiodes with device architectures Al/Ti/SiNWs/pc-Si/Ti/Al, Al/Ti/n-SnO2/pc-Si/Ti/Al and Al/Ti/n-SnO2/SiNWs/pc-Si/Ti/Al are fabricated and their UV sensing behavior is studied by recording their V–I characteristics under dark and UV-radiation. The recorded V–I curves of the fabricated devices show diode like behavior and their rectification ratio, turn on voltage, effective barrier height and sensitivity are calculated and compared. Under UV exposure, the V–I studies under forward and reverse biasing for the device Al/Ti/n-SnO2/SiNWs/pc-Si/Ti/Al shows significantly higher rectification ratio, sensitivity, responsivity and detectivity around 172.3 at ± 9 V, 64, 0.3456 A/W at 5 V and 8.02869 × 1012 Jones respectively. Further, the photo-resistive measurements of the device also show its excellent reproducible nature. This better UV sensing behavior is also supported with proposed UV sensing mechanism under biasing conditions. The authors are thankful to Dr. Ashok K. Chauhan, Founder President, Amity University, Noida for his continuous encouragement. The authors would also like to thank Dr. D. N. Singh from IndoSolar Pvt. Ltd., India for providing the silicon wafers to carry out the experiments.